Download "ELL/SDAIE Strategies Instructional Strategies used throughout the year:"
2 "re-presentation." Cooperative Graphing - This activity involves graphing information based on a survey. Each group of four will take a survey of how many countries each has visited (or other teacher-determined information). A bar graph is then developed. Each person in the group is responsible for one aspect of the graph, and signs his/her name on the chart along with their area of responsibility. Jobs are: survey group members and record results, construct the graph, write names and numbers on the graph, write title and assist with graph construction. Each person in the group describes his/her part of the graph to the class. Corners - Cooperative activity used to introduce a topic. The teacher poses a question or topic along with four choices. On a 3x5 card students write their choice and the reasons for it. Students go to the corner of the room representing their choice. In their corner, students pair up and share their reasons for selecting that corner. The topic is discussed. For example, the corners could be labeled cone, cube, pyramid, and sphere with information about each figure provided. Students go to the corner, learn about the figure, and return to teach other team members. 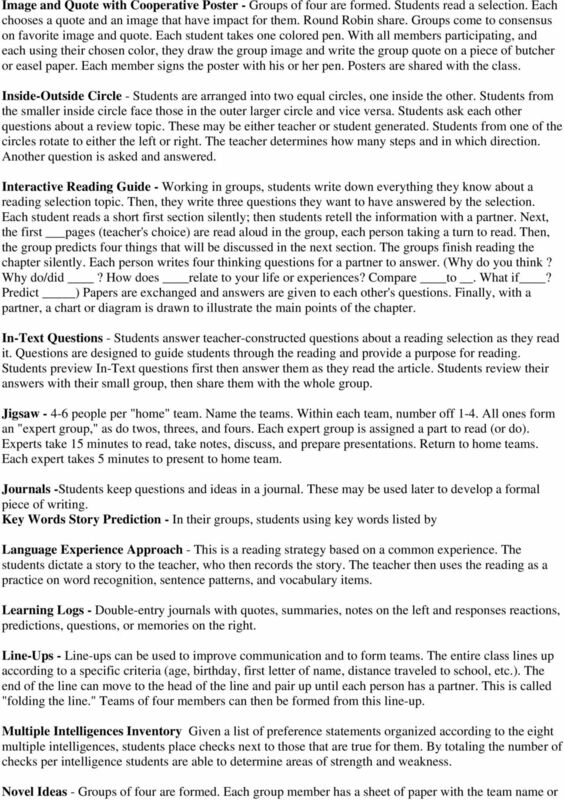 Directed Reading-Thinking Activity This is a group activity to get students to think about the content of a fiction or non-fiction reading selection. The steps are 1) Students predict what they will read and set purposes for reading. 2) Students read the material. 3) Students discover if their predictions and hypotheses are confirmed. Famous Person Mystery - The name of a famous person, living or deceased is placed on the back of each student. Without looking, students try to guess who the person is by asking questions that require only yes/no answers. Graphic Organizers - Graphic organizers are charts, graphs, or diagrams, which encourage students to see information as a component of systems rather than isolated facts. Students may complete these as they read or view a presentation. There are a variety of ways to use graphic organizers, including the following: semantic word map, story chart, Venn diagram, spider map, network tree, word map, and KWL chart. 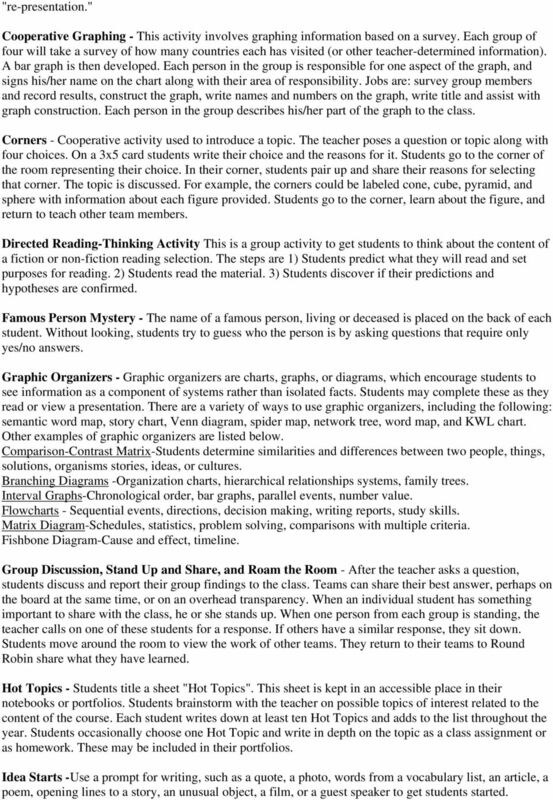 Other examples of graphic organizers are listed below. Comparison-Contrast Matrix-Students determine similarities and differences between two people, things, solutions, organisms stories, ideas, or cultures. Branching Diagrams -Organization charts, hierarchical relationships systems, family trees. Interval Graphs-Chronological order, bar graphs, parallel events, number value. Flowcharts - Sequential events, directions, decision making, writing reports, study skills. Matrix Diagram-Schedules, statistics, problem solving, comparisons with multiple criteria. Fishbone Diagram-Cause and effect, timeline. Group Discussion, Stand Up and Share, and Roam the Room - After the teacher asks a question, students discuss and report their group findings to the class. Teams can share their best answer, perhaps on the board at the same time, or on an overhead transparency. When an individual student has something important to share with the class, he or she stands up. When one person from each group is standing, the teacher calls on one of these students for a response. If others have a similar response, they sit down. Students move around the room to view the work of other teams. They return to their teams to Round Robin share what they have learned. Hot Topics - Students title a sheet "Hot Topics". This sheet is kept in an accessible place in their notebooks or portfolios. Students brainstorm with the teacher on possible topics of interest related to the content of the course. Each student writes down at least ten Hot Topics and adds to the list throughout the year. Students occasionally choose one Hot Topic and write in depth on the topic as a class assignment or as homework. These may be included in their portfolios. Idea Starts -Use a prompt for writing, such as a quote, a photo, words from a vocabulary list, an article, a poem, opening lines to a story, an unusual object, a film, or a guest speaker to get students started. 4 number in the corner. Each person writes, "We think a story/selection entitled (insert appropriate title) might be about..." Each person then has one minute to list what he or she thinks the story might be about. For example, a story entitled "Eleven" might be about a football team, roll of dice, etc. Each person draws a line. Members Round Robin share their lists. As each member shares, other members add new ideas to their lists. Groups then take turns standing in a line and reading their possible topics for the whole group. Topics may not be repeated. All students add new or "novel" ideas, not on their lists. Numbered Heads Together - A 5-step cooperative structure used to review basic facts and information. Students number off I to 4. Teacher asks a question. Students consult one another to make sure everyone can answer the question. Teacher randomly picks a number from 1 to 4. Those students with that number raise their hand: Teacher randomly chooses one of the groups. The group member with the previouslyselected number answers the question. After the student responds, the other teams may agree with a thumbs up or a thumbs down hand signal. Teacher may ask another student to add to the answer if an incomplete response is given. Open Mind Diagram - Each person in a group of four uses a different colored marker to participate in the poster creation. Students draw a shape of a head and, inside the head, write words, quotes from the story, symbols and pictures. Words can be made into pictures of parts of the face. Pairs Check - Cooperative pairs work on drill and practice activities. Students have worksheets. One student answers the first question while a second student acts as the coach. After the coach is satisfied that the answer is correct, then roles are reversed. Then this pair can check with the other pair on the team. If all agree, then the process continues. If they do not agree, students try one more time to figure out the answer, or ask for help from the teacher. Pantomime-A-Tale - This technique can be used with fiction or nonfiction reading selections. Divide an article into sections. Each group prepares their assigned section as a pantomime. There should be one group member who reads the section, with appropriate pauses, and three members who act it out without using words. Rehearsal is important, so allow time for it. Pass the Picture -Each person in a group has a visual of a person. A blank sheet of paper is clipped to the back. The teacher asks a question (e.g., "What is his/her name?"). Students write the answer in a complete sentence on the blank paper. Students then pass the visual and the paper to the student on the right. The teacher continues asking questions and students continue writing the answer, then passing the visual to the right for 6-8 questions. At the end, each student will have a descriptive paragraph for each visual. Each student takes a visual and shares it with the group while reading the final paragraph description. 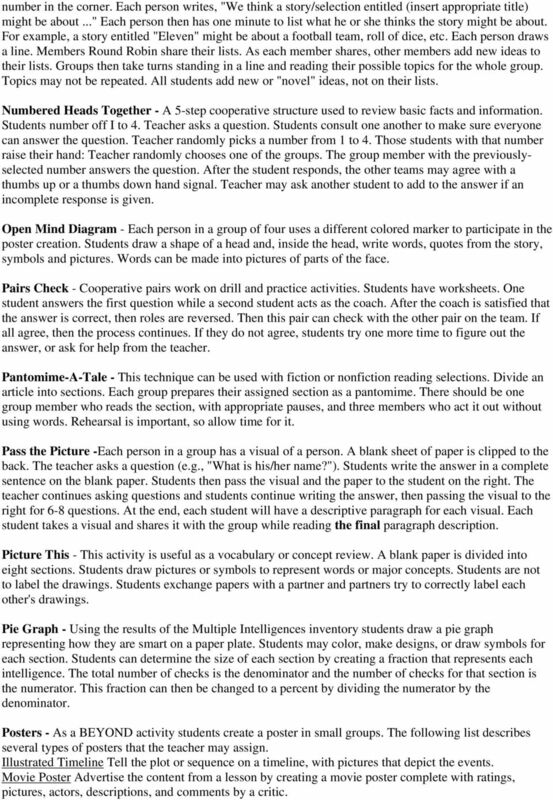 Picture This - This activity is useful as a vocabulary or concept review. A blank paper is divided into eight sections. Students draw pictures or symbols to represent words or major concepts. Students are not to label the drawings. Students exchange papers with a partner and partners try to correctly label each other's drawings. Pie Graph - Using the results of the Multiple Intelligences inventory students draw a pie graph representing how they are smart on a paper plate. Students may color, make designs, or draw symbols for each section. Students can determine the size of each section by creating a fraction that represents each intelligence. The total number of checks is the denominator and the number of checks for that section is the numerator. This fraction can then be changed to a percent by dividing the numerator by the denominator. Posters - As a BEYOND activity students create a poster in small groups. 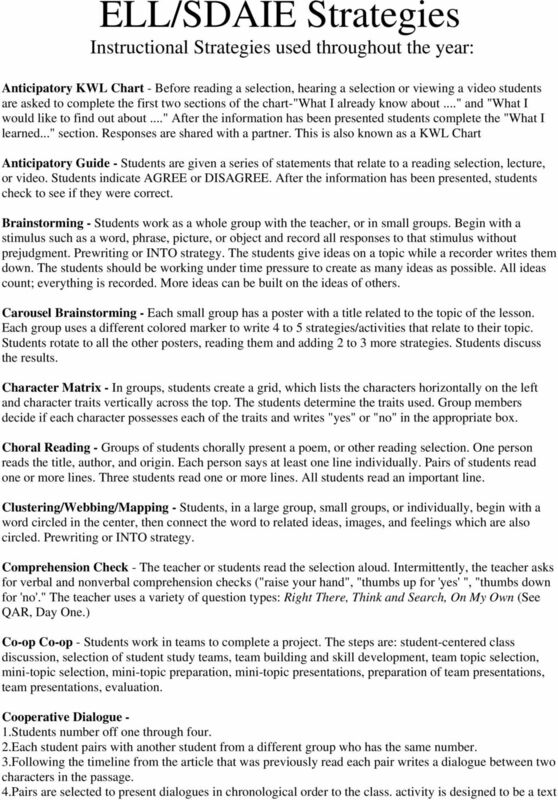 The following list describes several types of posters that the teacher may assign. Illustrated Timeline Tell the plot or sequence on a timeline, with pictures that depict the events. Movie Poster Advertise the content from a lesson by creating a movie poster complete with ratings, pictures, actors, descriptions, and comments by a critic. 7 their own estimate if they disagree with the average. Actual answers are given after the students share estimates with the whole group. Tableau - The students form a tableau of characters or scenes or concepts. The teacher directs students regarding their positions and facial expressions. Students hold their positions in a brief tableau. Tap-A-Word - Students practice pronouncing words or phrases by using a combination of claps, hitting the table, and snapping the fingers. the teacher. In Round Table style, each member uses a word from the list, in the order given, in a sentence to create a collaborative story. Think-Pair-Share - When asked to consider an idea or answer a question, students write their ideas on paper (think). Each student turns to another student nearby and reads or tells his or her own responses (pair, share). This is an oral exchange, not a reading of each other's papers. Three Step Interview - Group participants letter off A-B-C-D. 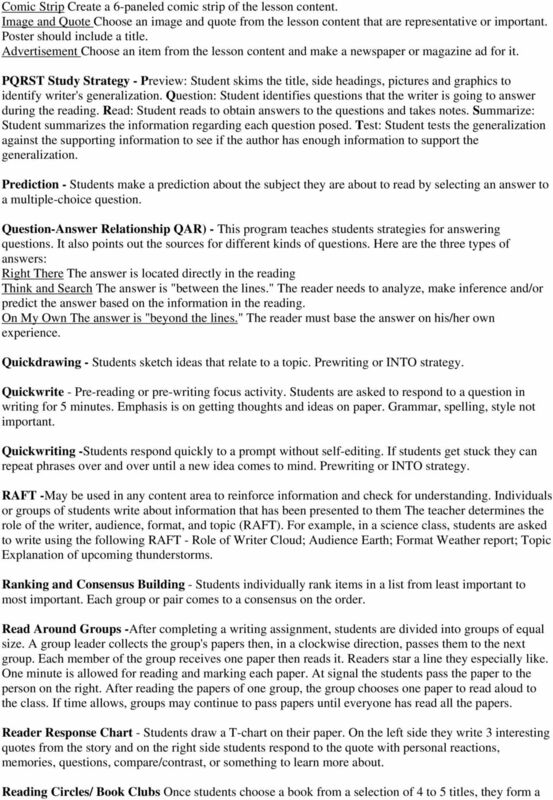 They use the following interview steps in order to share what they have written in a quickwrite until they all have been read. 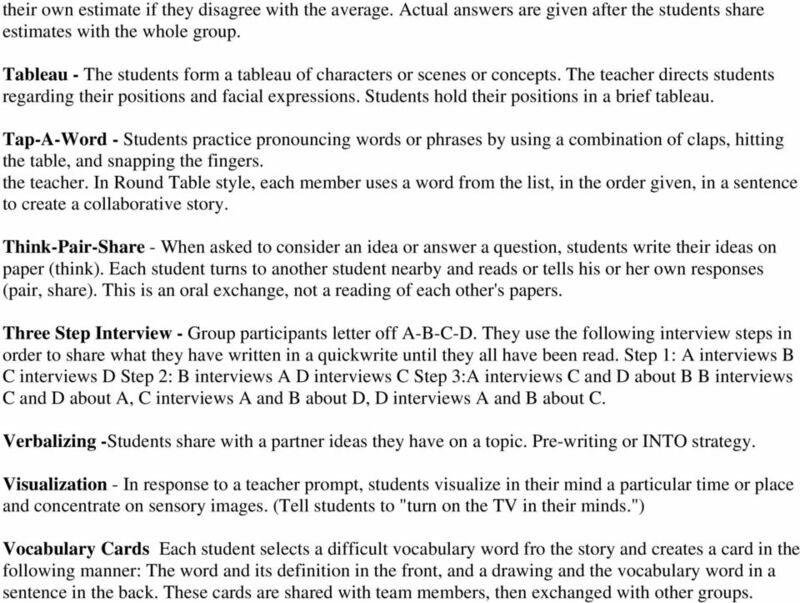 Step 1: A interviews B C interviews D Step 2: B interviews A D interviews C Step 3:A interviews C and D about B B interviews C and D about A, C interviews A and B about D, D interviews A and B about C. Verbalizing -Students share with a partner ideas they have on a topic. Pre-writing or INTO strategy. Visualization - In response to a teacher prompt, students visualize in their mind a particular time or place and concentrate on sensory images. (Tell students to "turn on the TV in their minds.") Vocabulary Cards Each student selects a difficult vocabulary word fro the story and creates a card in the following manner: The word and its definition in the front, and a drawing and the vocabulary word in a sentence in the back. These cards are shared with team members, then exchanged with other groups. Selected Strategies 1. Analysis Pizza (Pettigrew) 2. Anticipation Guides (Readance, Bean, Baldwin, 1981) 3. Characterization Chart (Price-Hawkins, TAAS Reading Workshop, Region XIV ESC, Abilene, TX) 4. Ohio Standards Connection Data Analysis and Probability Benchmark C Represent data using objects, picture graphs and bar graphs. Indicators 3. Read and construct simple timelines to sequence events. 5. These choice boards were developed by the talented secondary teachers from the Northwest Region that attended our workshop on Friday, April 20, 2007.